I'm making Jen Kingwell's "Broken Dishes" quilt at present. The blocks do go together very easily. The key is to remember to always have the b & w triangle on top when sewing up the pairs & to always sew the seam on the same side!! And once you have made a few, the star & circular patterns come out really effectively! It seems I have a predominance of blues in my stash, and not much variety of low volume black & whites. For a couple of my darker b & w I did find using the "wrong" side worked ok! But still haven't got much of an assortment here. In the interests of dieting - fabric diet that is - I'm thinking maybe a scrappy fabric swap might be the way to go?!? Linking up with WIP Wednesday later on. A few of our Monday Modern group have started a fabric diet support group, great idea! I haven't made any real commitments regarding not buying fabrics, mainly because I know I would inevitably not stick to it!!! ..........but this year I too am really, really trying to use what I have. So, my fabrics here at home have been the starting point for most of my sewing lately. I also raid the big basket under the sewing table where all my little scrappy offcuts go! My fabric choices have been a real random mix n' match between colours & collections over the years and, luckily now, I find there's really something very appealing about a scrappy quilt. This weekend I'm going to make a start on one of Jen Kingwell's patterns. It's a colourful scrappy quilt, with a bit of black & white to add a "modern" twist, just perfect for me & my stash !! This morning I pulled out a few low volume black & whites, along with some of my favourite bits of print fabric, and began to cut out. One huge Gypsy Squares quilt top ....done! Well I must admit, I've always wanted to make a Clamshell quilt. And I checked out Latifah Saafir's free patterns for a 4", 6" & 8″ Glam Clam or 12″ Glam Clam quilt, each with printable templates & detailed instructions!!!! I'm thinking maybe just a baby size quilt to trial it, something soft & pretty. Has anyone else tried this method? What a gorgeous week it's been so far!! Spent a lazy sunny Sunday afternoon at the band rotunda in the domain listening to jazz, gardening the next day, followed by an "olive day" with dancing & swimming lessons! It's the Chinese Lantern Festival up next, so...not too much time for sewing! the border onto my Vintage Rosy Quilt. once I'd joined a few smaller pieces together! And I've re-arranged my squares on "the big quilt"
and maybe a bit of simple quilting eventually?!? Later today I just wanted to relax, put a border on my vintage rosy quilt, & layer it up ready for quilting. But... my daughter needs a new quilt! She does, of course, have several quilts, however they are not big enough!! They have a kingsize bed and while I have made a couple of larger quilts, none of them go over the sides & the bottom of the bed. I did suggest she simply buy something to cover the whole bed & then pop her quilts on top. But no, she did the maths stating that large scrappy squares would do it (how is it that she can work out exactly how many squares I'd need so quickly?!? ), & then began pulling fabrics out from everywhere. I tried to remind her about chosing large & medium scale prints, some stripes maybe, a few solid fabrics, and assorted small scale prints to ensure everything would work well together. We had alot of fun mixing things up ....AMH, Kaffe, Amy Butler, a bit of Denise Schmitd, and I found that the pearl bracelet fabrics added a real calmness! 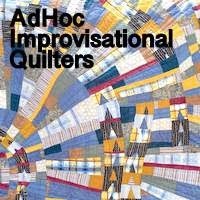 Do others make larger quilts? Without using any real pattern, I feel there's such a lot to factor in really.... the expense, the time, the worry that it won't gel, etc. I really want to use just my stash fabrics for this, but some bits are small so that in itself is an issue. And I am of the feeling that we really need to plan this a bit more, especially as it's to be so large. So I put together a few options, and am still v. unsure which way to go!!!! I would really appreciate some quilty input here please!!! ....it needs to be such a big quilt, I am reluctant to start! *Updated Sunday - just reading Sarah's latest entry over @ http://sarahquilts.com/ very interesting, and all the comments also applicable & v. helpful for me just now !!! a real thing for blue! Do others have a colour that you almost always include in your patchwork? I certainly do ...and it's blue! I seem to use it consistantly, it's a real favourite & I throw a bit in here & there, into almost everything I make! I haven't, however, made a mainly solely blue quilt, but today I gave it a go! Well, what can I say?!?? and then a few browns! 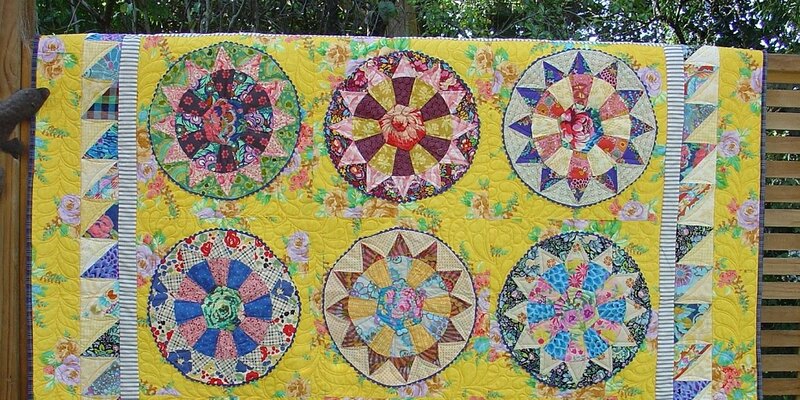 so I guess now it's a very "vintage" rosy quilt!!! The last few quilts I have made lately have had a similar trend, or look about them.... larger blocks, repeated shapes, chain pieced, and v.quick & simple to make! And I haven't got too attached to the finished result during the process!! The colour choices have been my stumbling block but I love experimenting & trying to create some contrast happening, along with a sense of overall balance. In the past I have found that having a few of these quilts around has been v. handy, all quilted (even if it's simple straight line quilting!) & bound waiting for a new home. I give them away as birthday presents, or gifts for a newborn, or charity, or more recently, I have given quilts to friends/collegues who may be having a rough day. But today, I thought I'd tackle a bit of recycling!!! I thought I'd recycle some of these precious leftovers into something, and that I would keep this quilt for myself !! (After all, it's all my sewing hours history!!). I found the "Pop Stars" quilt from my Material Obsession 2 book..... a stash quilt - perfect! ..........and, as the book says, "slow progress but warmly satisfiying!!! So what other lovely scrappy things are you all making?